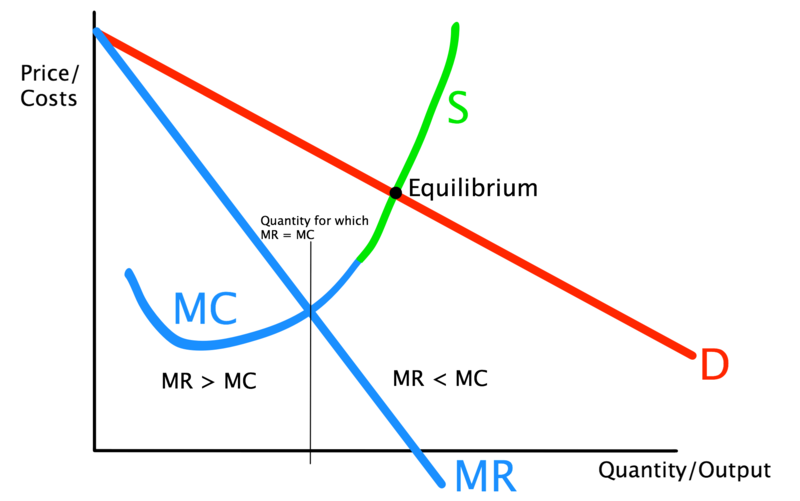 The figure above indicates that in almost any case, because MR is to the left of D, if a firm produces the quantity at market equilibrium, MR < MC, which means that the firm would be actively losing profits. So, why do firms even bother going to market equilibrium - from a theoretical standpoint? The MC curve can only be seen as a supply schedule for the individual firm if it is a price taker. In the case you depicted, however, we have imperfect competition. A profit-maximizing firm will thus produce where MR=MC, and charge a price that will induce consumers to purchase this quantity (which can be read off the demand schedule). In this sense, there is no "disequilibrium": the firm is doing the best it can (so it has no reason to change), and total quantity demanded is equal to total quantity supplied (i.e. there is market equilibrium). Basic question about why supply/demand should move to the equilibrium price?